A table painted with roses. Maybe it was the first time I came across a poem, post-college, whose language was vernacular, whose ideas were transparent or seemed to be. Maybe it spoke to me about the surprises of life, how unimportant things can become important, how every moment is pregnant with possibility and meaning. 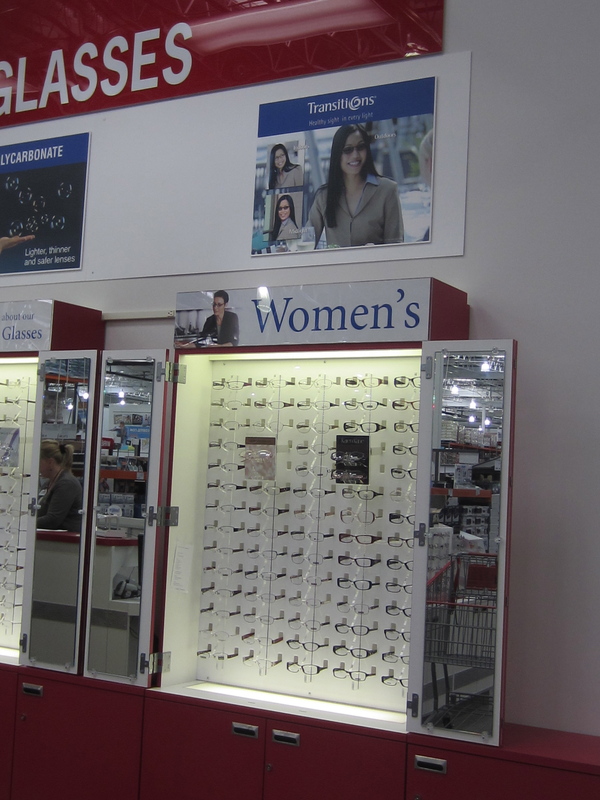 How the poem ended up in the Costco optical department is another story. Because my eyes have gotten increasingly sensitive to sunlight as I’ve aged and I can’t wear contacts all the time, I decided to get prescription sunglasses. I wanted to “meet the light completely,” so to speak. Mirrored lenses, I figured, would keep the sun out best. Big mistake. Trying on my new insistently reflective sunglasses, I deceived myself that I looked less like a blind lady than Neo in Matrix, and I wore them, nervously checking the rearview mirror at every stoplight, until I picked up my daughter from school. She cringed at the sight of me. “Coraline’s parents,” she said, referring to the animated character’s frightening black-button-eyed torturers. Within the hour I was back at Costco with the offending glasses in my purse and-–egads—a good poem to tape to the glasses display. 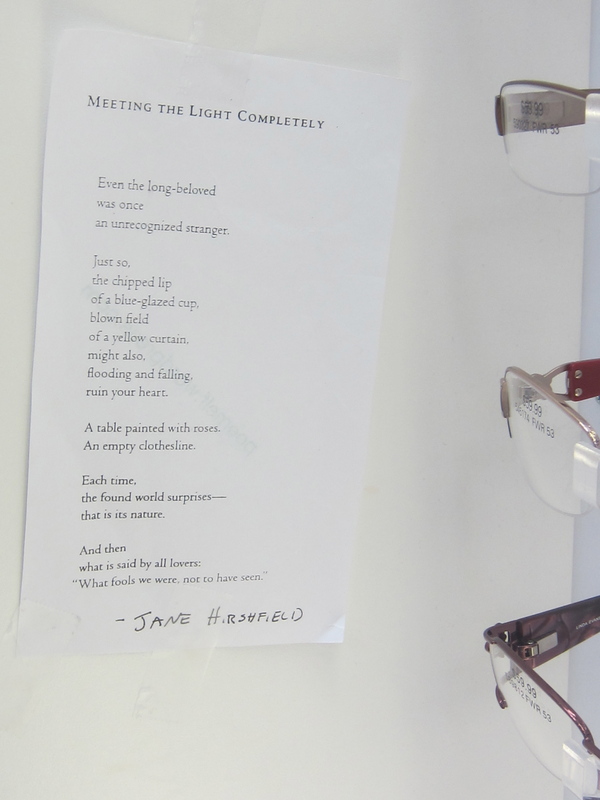 I hadn’t realized until I left the poem amongst the glasses how much the poem is about seeing. All the images are visual, the observations of someone who is looking carefully. But the poem is also about what can’t be seen. Meeting the light completely would lead to blindness, at least that’s the strong impression my dad made when he would take us outside to look at a solar eclipse through sunglasses. We can be blind to the meaning of things as we experience them. Only with distance or through a glass darkly can we perceive reality. Meg Ryan built a whole career on that same trope, What fools we were not to have seen. Consider You’ve Got Mail, When Harry Met Sally, Addicted to Love, even Sleepless in Seattle in its own way. All well and good but for the troubling middle section of the poem, the furnished section. Here the act of seeing doesn’t lead to love. Instead it can ruin your heart. Setting aside the nod to William Carlos Williams’ “so much depends/ upon / a red wheel / barrow,” could a yellow curtain ruin your heart? That would be a good creative writing exercise (write a story where a yellow curtain ruins your heart) because writers work with details and these details, let’s call them objects, carry memories and associations. Reminding the observer of something else, something painful or beautiful, objects can ruin your heart. Or is ruin your heart a misanthropic phrase for falling in love? I don’t think the luminous Hirshfield, a practicing Buddhist, is capable of misanthropy. So why the brokenness and ruin in the middle of such a romantic poem? The cup is chipped, the curtain flooding and falling. The arc of the billowing curtain suggests that both in love and then out of love we can fail to see. When we love we can be blind to faults; when we’re out of love we can be blind to virtues. Roses are a traditional symbol of love; the emptiness of the clothesline suggests absence and loss. Flooding and falling again, and yet, the poem isn’t dark or broken-hearted. 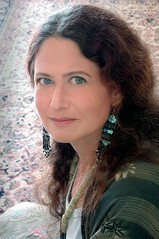 Jane Hirshfield was born in 1953 in New York City. After graduating from the first Princeton class to include women, she moved to San Francisco to study Zen Buddhism for eight years. She has published seven books of poetry and, as a translator of Japanese poetry, has helped popularize tanka in the United States, a form which now has a solid place in fifth grade English curriculums. She’s also an extraordinarily beautiful woman. Her picture is a visual translation of “Tupelo Honey,” my favorite Van Morrison song. In my mind it’s Jane Hirshfield on the cover of that album—her curly hair flooded with sunlight and hanging over the white horse who gently leads her through the woods. Sans mirrored sunglasses of course.